My Biking Buddy, My Pal! He'd call say "Let's go for a ride"
I'd say sure where we going? but he had a plan up his sleeve. I did too for I was with my biking buddy! He didn't mind, he was loving and caring. 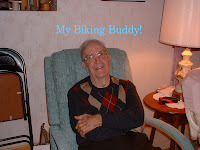 I will never forget you my biking buddy! I will carry you in my heart always and forever! This was written for him and placed with him when he passed. He was a very special uncle to me. I had a very difficult time and still do since he passed March 3, 2008. I gave a copy of the poem to my Great Aunt - she said she'll cherish it and read it daily. She said you hit it right on about the two of you. I wanted to post this, but like I said it's been difficult because he and I were so close. Thank you for looking.